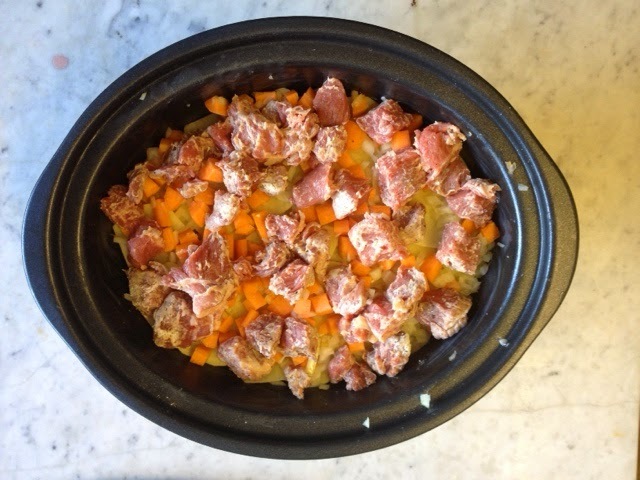 A slow cooker is a magical wee creature. Pop in an assortment of bits and bobs before you head out for the day and on your return the place smells amazing and you have a fantastically comforting one pot dish with very little effort and not too much washing up! My slow cooker is something that always gets dug out as the nights get darker, the weather turns autumnal and the clocks fall back. Up until recently I've only had a huge 6.5ltr crock which has been both a blessing and a curse. Great for batch cooking and large items like a joint of ham or a whole chicken but not so good on a day to day basis. I've recently added a smaller 3.5ltr one to my kitchen armory so 'Slow Cooked' couldn't have arrived at a better time. 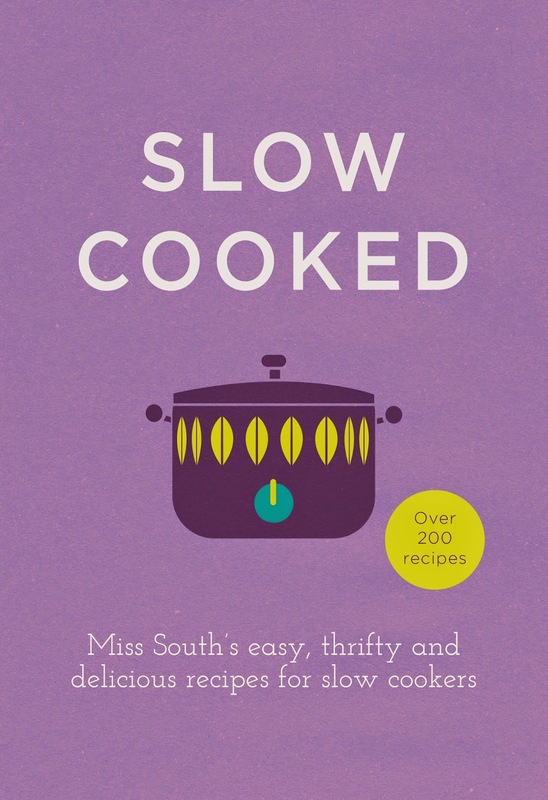 The author of Slow Cooked - easy, thrifty and delicious recipes for slow cookers is none other than Miss South who I previously 'met' on her first book the wonderful Recipes from Brixton Village. The book is night and day from any other Slow Cooker Recipe Book I've previously encountered. Yes there are the usual soups and stews but there's also cakes, bread, fish, seafood, vegetables and preserves which prove just what a versatile piece of kit a slow cooker can be when you break free of its traditional shackles. My review copy arrived just before Halloween and a recipe for Stuffed Pumpkin immediately caught my eye. Check your pumpkin fits the slow cooker. For a 3.5 litre slow cooker, I used a 7.5” pumpkin. Line the crock of the slow cooker with double thickness foil or reusable baking liner. The liner looks like thicker, stronger baking paper but is heat resistant and washable. You can buy in cooking shops, but I got mine in the pound shop and even if you pay more than that, it is much more economical than foil long term. Take the top off the pumpkin with a sharp knife. You want it to resemble a lid. If needs be, trim the stem down so it doesn't protrude and stop the slow cooker lid from fitting. Hollow the seeds and innards of the pumpkin out. Reserve the seeds for later, but discard the slippery bits. Cut the sausages into 2-3cm pieces and lightly brown them in a pan for about 3 minutes. I don't think it improves the flavour especially but they look unappetising otherwise. Drain the cannellini beans and rinse them well. Mix them in a large bowl with the tomatoes, tomato puree, spices and the now browned sausages. Combine well so it is all evenly distributed. Season well. 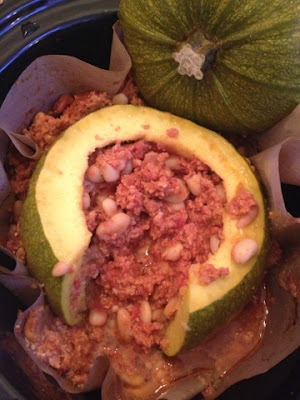 Put the pumpkin into the lined crock and carefully put the sausage and bean filling into the pumpkin. Top up with the stock and the Worcestershire sauce. 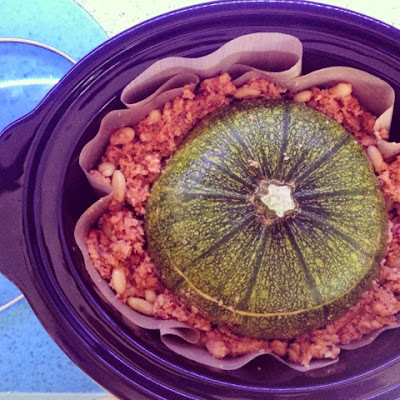 Put the lid on the pumpkin and then the lid on the slow cooker. Cook for 8-9 hours on low. The pumpkin will darken in colour and become soft and tender without collapsing. While it is cooking, wash and dry the seeds from the pumpkin by laying them on a baking tray lined with kitchen roll for a couple of hours. About 15 minutes before you are ready to serve the pumpkin, toast them on a low heat in a dry frying pan on the stove. Watch them carefully so they don't burn. Take them off the heat when golden brown. Scatter with salt, a pinch of cayenne and some black pepper and serve sprinkled over the wedges of pumpkin for some crunch. Firstly I removed the meat from my sausages. This is what happens when you make assumptions and don't fully read the recipe before you start prepping! Although my pumpkin was the weight specified in the recipe I only managed to get around half of the filling inside it, the rest I spread around it. The seeds in my pumpkin were unbelievably slimy so they all ended up in the compost bin rather than being toasted and sprinkled. The resulting dish was loved by the whole family - even picky girl! The use of reusable baking liner in the crock is sheer genius! Coat your meat with the flour mixed with some salt and pepper. Set aside while you sliced your potatoes as thinly as possible. If you have a mandolin, life will be easier. If not, use a knife to make them just a few millimeters thick. Brush the bottom and the edges of the slow cooker crock with about half the butter and then layer some potatoes into the base. 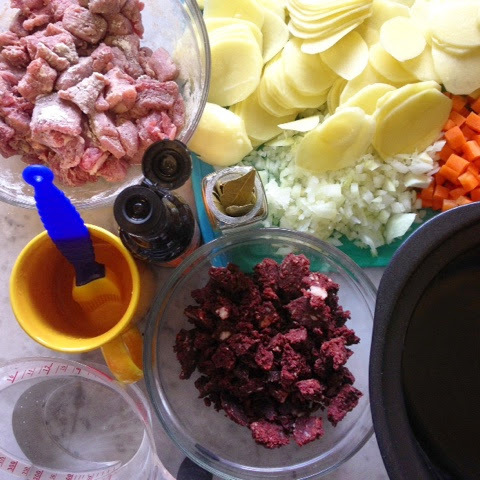 I usually do two layers here and then I put in half the skinned and crumbled black pudding with some of the onion. Add another layer or two of spuds and then half the lamb and carrots. Repeat another layer of potatoes, then the rest of the black pudding and onions. Next up is more potato and then the remaining lamb and carrots. Add the bayleaf. 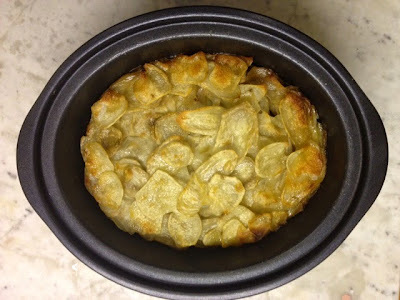 Finish off with a final layer of potatoes. Mix the Worcestershire sauce with the water and pour it all over the hotpot. Brush the top layer of potatoes with the remaining butter and put the lid on the slow cooker. Cook the hotpot on low for 8-9 hours. The potatoes on the bottom will crisp up and caramelise while the lamb steams and the black pudding melts it all together making each layer extraordinarily good. Serve with red cabbage and a healthy appetite. This was another big hit. I pretty much followed the exact recipe although I found that I needed a lot more potatoes than specified. 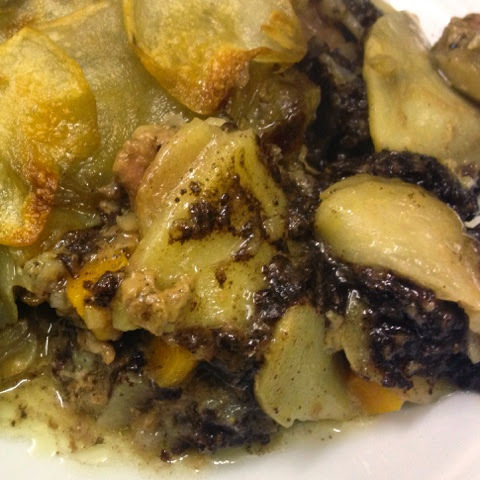 For my Black Pudding I used the fantastic Ritchies of Aultbea. Before serving I popped the crock under the grill for a few minutes to crisp up the potato topping which, in my opinion is well worth doing. Next time I'd sprinkle salt on each of my layers of potatoes as I felt it needed extra seasoning. Ebury Press have provided a copy of the book as a giveaway for readers of Foodie Quine. Entry is via the Rafflecopter widget below. To enter, let me know as a comment "What's your favourite Comfort Food?" For additional bonus entries you can follow me on Twitter or like me on Facebook. Good Luck! You can see what other bloggers thought of Slow Cooked on The Happy Foodie Slow Cooked Challenge. It has to be a roast chicken dinner! All lovely very scrumptious. I loved Miss South's cookbook and can't wait to try a few more recipes. It is a fabulous book which I have also reviewed. 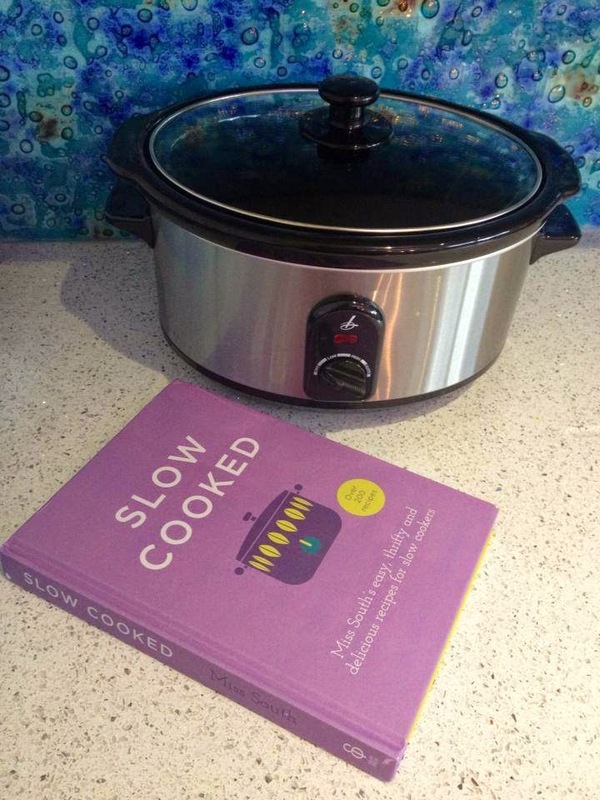 I would certainly encourage anyone interested in slow cooking to get a copy. it's got to be a roast dinner - especially if it's lamb with a good dollop of mint sauce! Sausage casserole and crusty bread yum!! Chicken Kiev and cheesy mashed potato! At this time of year a long, slow roasted risotto with wild mushroom (if I can find any) yummness and boozey scrumptious-ness. Food so comforting you find yourself making up words to describe it. Failing that a gooey goats cheese on oatcakes wins my heart everytime. Sausages and mash with gravy! Congratulations Roz! A copy of Slow Cooked will be winging its way to you very soon. Happy Cooking. A large bowl of pasta, peas and sweetcorn mixed with a big dollop of houmous. The chicken stew has to have broccoli, sweet potato and carrots in, with yummy big fluffy dumplings. Curry, preferably with a bottle of wine! Definitely macaroni cheese - I make mine with blue cheese, leeks and pancetta! Sticky toffee pudding and custard! Wow! So many variations on the theme of comfort food. My mouth is watering and tummy rumbling just reading them. Congratulations to the giveaway winner Rosalind B. A copy of Slow Cooked is on its way.